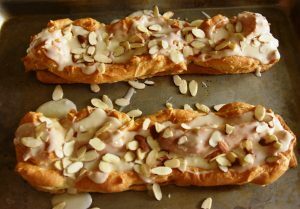 Danish Almond Puff: The scent of almonds and pastry baking makes this breakfast/desert recipe a favorite right out of the oven. 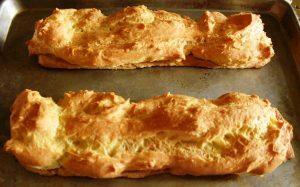 The custardy center gives this puff a soft texture while the crust adds a crispness to the taste. Sugarless, the pastry’s sweetness comes from the glaze or frosting. Easy to slice and serve, share the extra pieces with the office or neighbors. I found several variations of this recipe in my vintage recipe boxes, but not one with complete instructions. So I turned to my vintage cook books and found a recipe from a Betty Crocker’s 1960s recipe book. Heat oven to 350 degrees. Cut ½ cup margarine (or butter) into one cup flour until particles are the size of small peas (use a pastry blender or use 2 table knives, cutting through mixture in opposite directions). Sprinkle 2 tablespoons of water over flour mixture; mix. Gather pastry into a ball; divide into halves. Pat each half into a rectangle, 12 x 13 inches, on ungreased cookie sheet. Rectangles should be about 3 inches apart. Heat ½ cup margarine (or butter) and 1 cup water to rolling boil; remove from heat. Quickly stir in almond extract and 1 cup of flour. Stir vigorously over low heat until mixture forms a ball, about 1 minute; remove from heat. Add eggs, beat until smooth and glossy. Spread half of the topping over each rectangle. Bake until topping is crisp and brown, about 1 hour (Check after 45 minutes.) Cool. (Topping will shrink and fall, forming the custardy top.) Spread with powdered sugar glaze; sprinkle with nuts. Powdered Sugar glaze: Mix 1 ½ cups powdered sugar, 2 tablespoons margarine (or butter), softened and 1 ½ teaspoons vanilla. Stir in 1-2 tablespoons water, one teaspoon at a time, until glaze is of desired consistency. At the time this recipe book was published, it was perfectly acceptable to stop by someone’s house unannounced. In today’s world I suggest texting ahead. Thoughts from the Kitchen circuit. At 5- Daddy I know everything. At 20-What I don’t know isn’t worth knowing. At 35-Well, anyway, I know my trade. At 65-I’ve learned a little but not much! Someone worse than a quitter is someone who finishes something he should never have started. He who plants trees loves others besides himself.